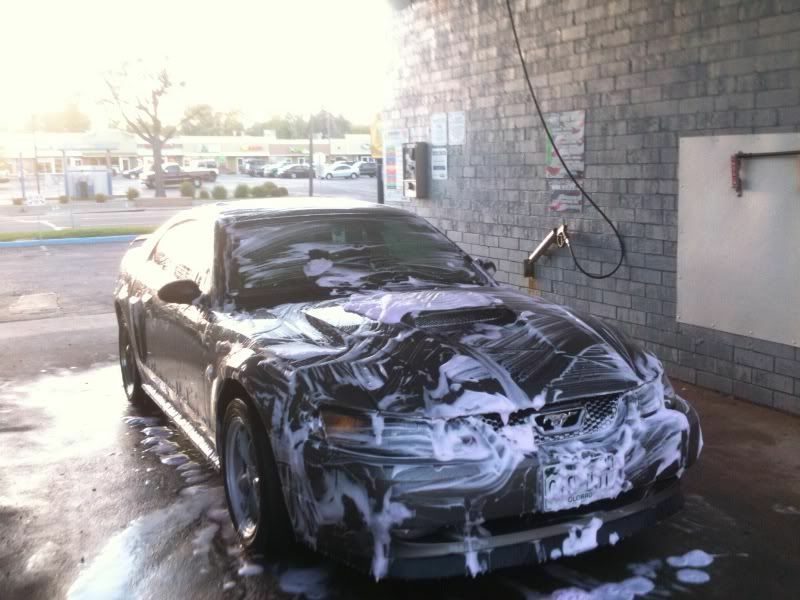 Forums at Modded Mustangs > Mustang Forums > General Car Care & Detailing > Is it possible for one to wash their car too often? Is it possible for one to wash their car too often? It's a problem. We're talking literally every third day. I can wash it for free. But still. Do I have a problem here? This is all before a good polishing too. Yea if you wash it more than 2 times a week for a month the paint will start to bubble........ I kid you not sir. For a second i thought i was looking at my car, besides the stock grill on yours its exactly the same. As far as washing too much i don't know, mine is garaged so it stays clean most of the time. A quick dusting every day keeps her clean then once every two weeks or so i'll wash it. Claybar along with a polish and wax every six months. Proof? I highly doubt that. i've been washing it twice a week for about 8 months now. I polish it probably once a month and wax it usually every 6. It's due for a waxing again in 3 months. The only thing it's done has made my body a mirror. Honestly though, is that too much? I dry it with a suuuuuuuuuper-soft rubber squeegee to get the water off and then terry-cloths for spots the squeegee can't get. I rarely use warm water. Only when I need to get bugs off. It's always a hand wash, and it's always soft. The only thing rough is the pressure wash.
Last edited by NoColoradoGT; September 28th, 2010 at 02:10 AM. Mineral Gray is the best color! Mach 1 Grill Delete is my next exterior mod along with black gloss vinyl letters on the back bumper to match my license plate decklid. 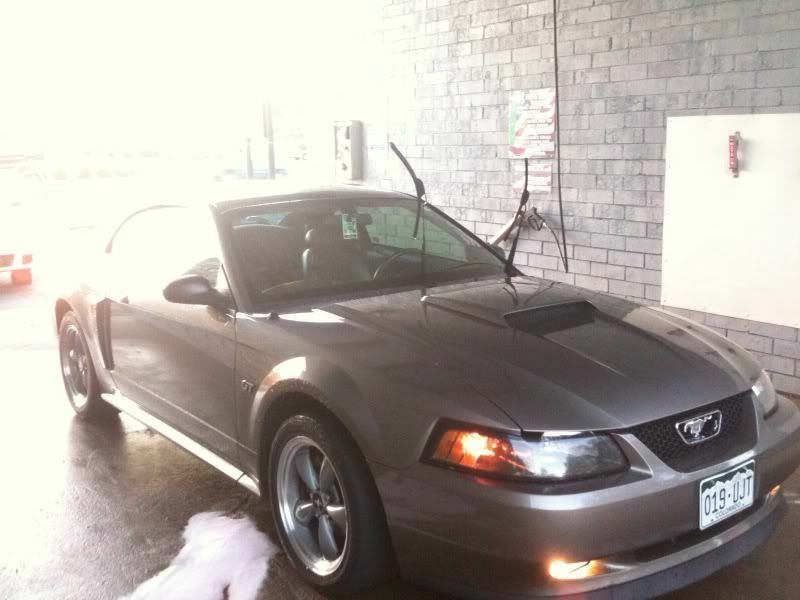 With regards to the "do I have a problem" question...I used to pull my wheels off with every car-wash and detail all my suspension, fender wells, exhaust pipes, lines, etc... I think you'll be ok, LOL. Last edited by Back2Mustangs; September 28th, 2010 at 02:24 AM. aaaaaallllll my own stuff. =] the only reason I use this place is because my dealer gets use for free and I only use the pressure hose. and I pull the wheels off too before every show. =/. I clean the engine bay every sunday too. My fiancee really has been on the verge of killing me for months now. It's nice when she helps though. glad to know i'm not alone on that though! thanks! Nah Im just kidding. To much high pressure washer isnt that good though. i wash mine once a week, 'self car wash' 2 weeks is the longest i'll let it go dirty. For instance, if you have a chip on your paint, and you hit the high pressure water to close to it, the water can get under the paint and cause it to bubble..... Or chip the paint more. I wash my car every couple of weeks or whatever, it's not perfect paint (chips and little scratches) and it's not a show car. It's a CAR, so I've accepted the fact that it's going to get dirty. I don't let it get real dirty, but I'd rather be wrenching on it every three days rather than cleaning it. Do the Right Thing, Cook. ~Zip. I would hate to pay your water bill. I haven't washed my car in like 5 weeks. Yeah. I said it. So how do you wash it since you say you just use the pressure washer, but in your picture it has that car wash foam on it from the brush or is that, that foam wax stuff? You shouldnt wash your car every three days unless it is really dirty, I hope you are using proper washing techniques so that you dont put scratches and swirls into your paint. At those car washes if your using the brush your going to scratch the crap out of your car because its full of dirt and grime even if you rinse it before using it. If you are instistant to wash your car every three days I say invest in a rinse-less wash like Optimum No rinse. It will be alot faster than your traditional wash and you dont have to take a high pressure washer to it every three days. Here is the kit but if you already have buckets, grit gaurds, quality microfiber, sheep skin mitt or sponge, detail spray, then all you need is Optimum No rinse which is $15. This is also a great kit for winter washing so your hands dont freeze and since you live in colorado it would be ideal for you. Check out both links like I said if you already have the items in the kit just order what you need. The second link is how you use the product since washing this way requires different techniques. is that car wash on 11th nice?